This is the reconstructed floor plan of the medieval Winchester Palace. Seen in the drawing are the various medieval gardens, courtyards, galleries, and buildings. Not clearly marked on the plan is the west wall with its famous rose window, which divides the Great Hall and the Wellhouse and Kitchen, and is the only remaining portion of the medieval palace today. 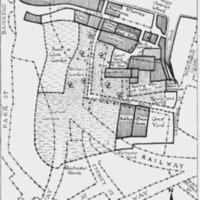 London City Council, “Winchester Palace (Reconstructed Plan),” Medieval London, accessed April 22, 2019, http://medievallondon.ace.fordham.edu/items/show/137.